The Notes app on your iPhone got a major overhaul in iOS 9. You can create notes that you can save or send through email, capture maps, photos, URLs, draw with your finger (iPhone 5 and later), and easily locate photos, maps, and anything else you attach using Attachments Browser. Start by tapping the Notes icon on the Home screen. If your iPhone has 3D Touch, you can press the Notes icon and use the quick action to open directly to a new blank note, a new photo, or a new sketch. When the folders screen appears, tap any folder to reveal a list of its contents. 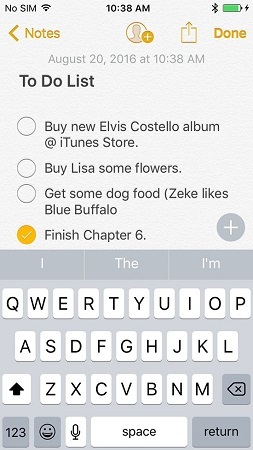 For example, this image displays a note contained in a folder named Notes; to return to the Notes folder, tap Notes in the upper-left corner. You can sync notes with your computer. And if you’ve enabled note syncing for more than one account (tap Settings → Mail, Contacts, Calendars), you’ll see not only your iCloud Notes folder but also a folder for each additional account that’s syncing Notes. Tap a folder to see its list of its contents; tap the < in the upper-left corner of the screen to return to the list of folders. Now, create a note by tapping the New Note (pencil on paper) icon in the lower-right corner of the screen. The virtual keyboard appears. Type your note. To modify the formatting or spice up your note with a checklist, photo, video, or finger-doodle, tap the little plus-in-a-circle, above the keyboard on the right. A row of buttons appears above the keyboard — checklist, formatting, add photo or video, and finger-drawing (from left to right). To dismiss the buttons and go back to typing text, tap the X on the right side of the row of buttons. New in iOS 10 is the capability to share a note with anyone; to invite someone to share a note, tap the person-in-a-circle icon at the top center of the screen. If the invitee is not using iOS 10, he or she can view and edit the note on the web. For those using iOS 10, the shared note appears in their Notes app with a little shared icon before its name.